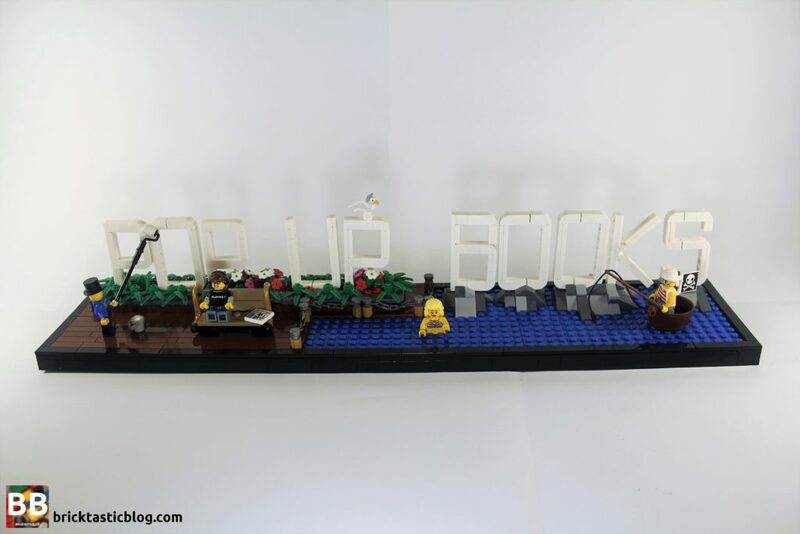 As you can probably tell by now, I’m a big fan of the LEGO Ideas Pop-Up Book project by Grant Davis and Jason Allemann. I’ve written about it here a couple of times briefly, but now I’d like to share my process. Of course, I’m by no means taking any credit for the mechanism – that’s definitely all Grant and Jason – I just made mine a bit bigger. They’re still the true geniuses behind the model itself! I’ve been asked many times by people that have seen the larger books – what was the process? How did you come up with the ideas for the stories? How did you know what to do? Well, sit back, grab a drink, and read on! 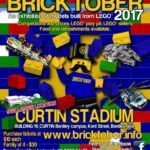 Now that Bricktober Perth 2017 is finished, I’m allowed to post photos and details of all three, so I’ll be going through the process from start to finish. Ok, so the beginning I’ve covered before. 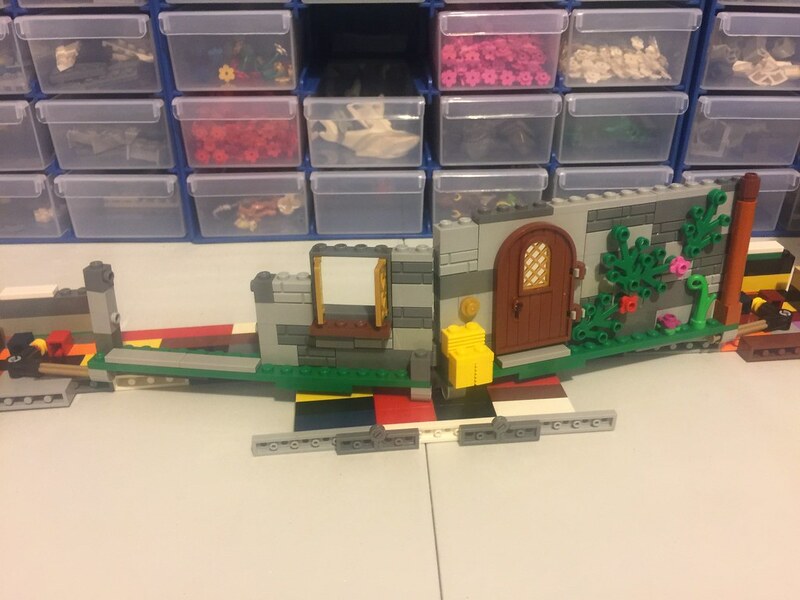 I saw the original project on LEGO Ideas, and loved it so much (being a librarian), I had to give it a go myself. I watched the video on LEGO Ideas over and over, paused it a few times when I needed to, and got stuck into some spare parts – no instructions this time! I needed to see what the mechanism would look like, and it’s dimensions, on a larger book format. It took a long time to figure out the right length for the mechanism, as I’d widened the spine from four studs to six. The whole reason to make it bigger was that I wanted more freedom to make cool stuff inside. More detail in the books would make them look really exciting. Once the spine and mechanism was modified, the pages had to be modified – now that the spine was wider, the pages had to meet in the middle when closed. Not only that, but the book was taller and wider, so the SNOT bricks that connected the pages to the cover had to be tweaked to line up correctly. It’s still not 100% perfect, as it takes a certain order of building to make sure they all clip in, but I got there. At this point, I realised just how much of a genius Grant and Jason are – the way the original is put together looks so sturdy. Mine sometimes take a little bit of a wiggle to close properly. Just so you get an idea of the size difference, here is my original book with the dimensions of the LEGO Ideas project highlighted. Next up was LEGO Digital Designer. 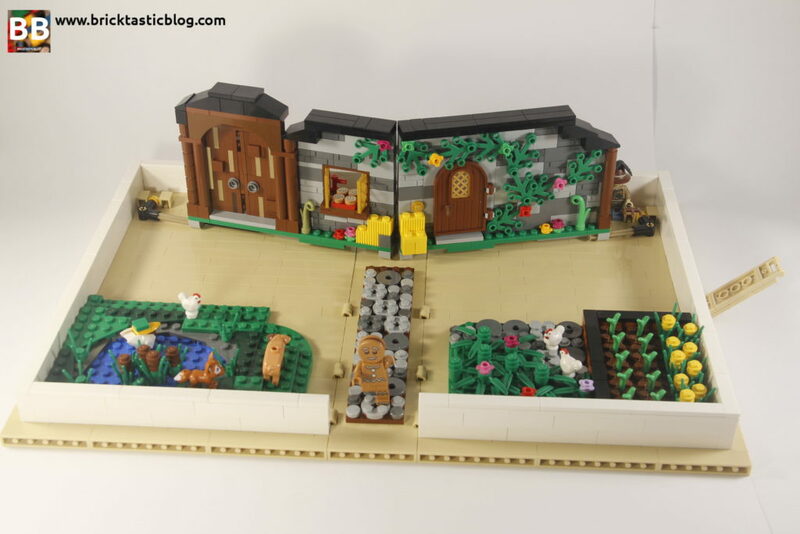 I knew what the overall size was like, but I knew I didn’t have anywhere near the right parts to make it, so I created the cover in LDD, and ordered the parts through Bricklink – by first ever order! Now that I knew what size it would be, the next step was which book to start with! After looking through my collection of minifigures and finding a Gingerbread Man, I knew that was it straight away. 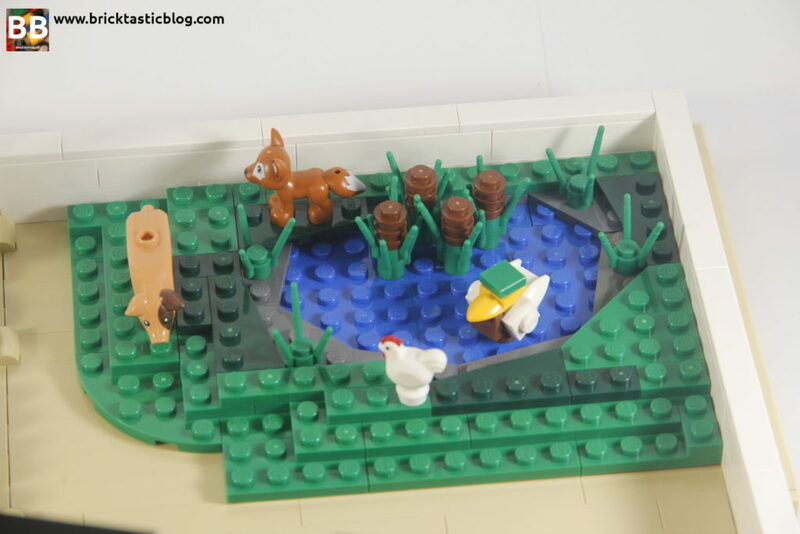 It also gave me an idea for a few little details, including a pond (the fairy tale has a river, but a pond was easier), a fox, a bit of a farm, and a kitchen inside, where the farmer’s wife was making the cookies. I had enough parts for the inside details, so I started building the house straight away, but it took a fair bit of fiddling around. I knew how wide it was meant to be, but I didn’t think about the height. Too tall or too many parts, and it was too heavy to lift itself. I had to compromise by shortening the height, and adding a stopper behind the central hinge so it didn’t straighten out and fall flat. Shortening the height also meant I had to change the way I had it planned out in my head, so I made it narrower, which forced the barn section to be added, but it was ok, because I got to try out a door technique I’d not had a go with before! It was a lot of rebuilding and starting again, but after a couple of hours, I was happy. It lifted and stayed up! Next was adding the “island” inserts. These originally came together very quickly, however I had to modify the undersides after I got the covers in as the plate edges were in the way of the SNOT bricks in the cover. Once the cover parts came in, it was an hour of assembly, and it was done! I was hooked. I knew straight away I wanted to do more, so I got straight in. This time, I had to do the whole lot in LDD, but I split the projects. One for the cover, one for the wall, and one for the two “island” inserts and interior details. The reason for three projects instead of one was mainly because I’m a novice at LDD, and also because I couldn’t figure out how to connect the mechanism virtually. I knew that splitting them would mean more work at the beginning, but later, all I’d need to do was change the colours of the cover, and keep within the size restrictions of the original (but modified) design. It made the process of making the next two much simpler. The next story was an easy choice for me – Treasure Island. 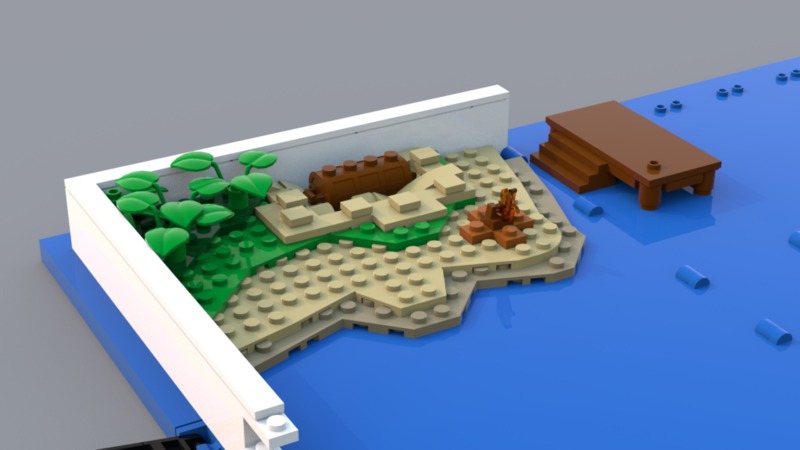 To be honest, I really just wanted to make a pirate one so I could put together the idea I had for a ship as the wall, but I figured there’s treasure, and there’s an island with pirates – let’s go with Treasure Island! Recolouring the cover was easy – a few clicks, some parts changes here and there, and voila. The hardest part about the cover, though, was the 1×2 hinges in blue. They’d only been in 14 sets before, with many of them being from the SpongeBob SquarePants theme, Education sets, or promotional sets, so they were quite hard to find! 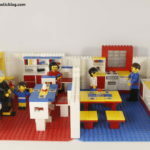 I had to submit my first (and only) European Bricklink order to get them in. Once the cover was done, it was time for the interior, designing in LDD. 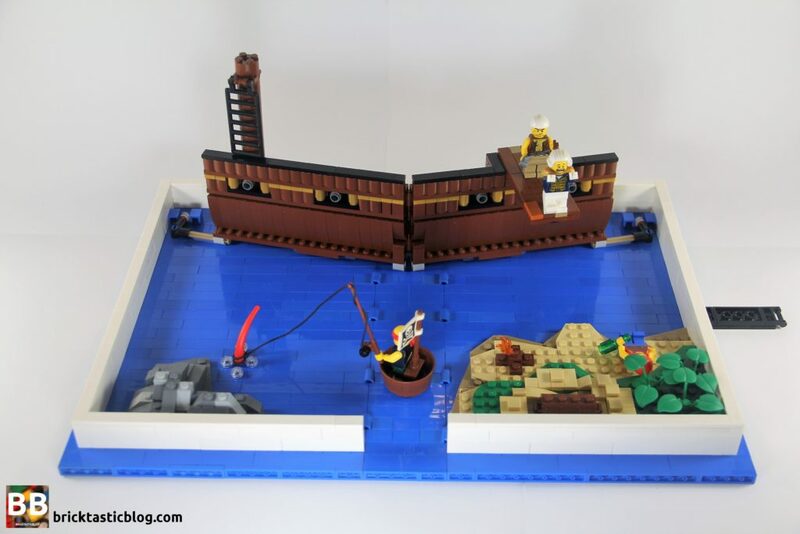 I’d originally decided on a pirate ship wall, island with uncovered treasure, rock formation with a tentacle sticking out of the water, a small interior to the ship itself, and a jetty running along the interior base of the spine. The hard part was the jetty. Of course, I wanted the jetty to be connected to the island, but because of the hinge, it simply wasn’t going to work. 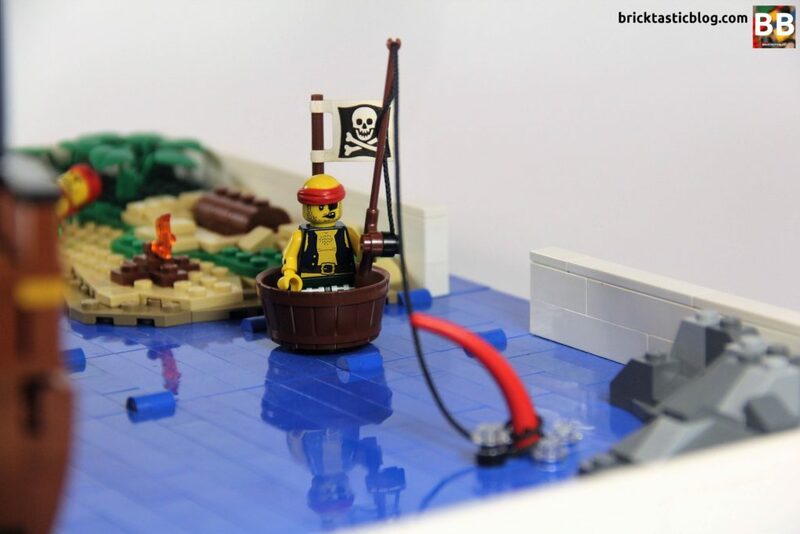 I decided to swap it out with a pirate in a boat instead. Once I’d modified the island, I quickly designed the other sections and ordered the parts. The parts had finally come in, and I was presented with a new problem. Although it looked great in the LDD project, it didn’t actually connect together very well! I’d neglected to make sure that plates were connected with other plates securely. I had built it according to my original design, but there were angled plates falling off all over the place! A quick redesign on the fly and it was ready to go. 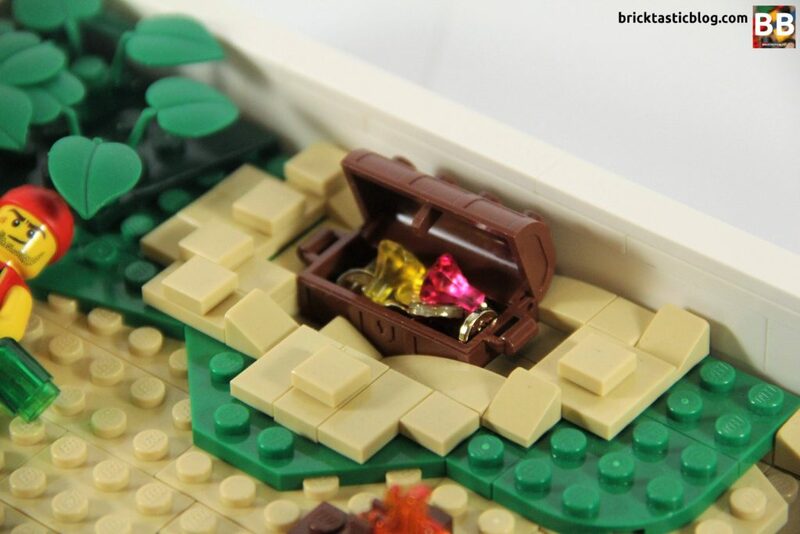 I was really pleased with the dug out treasure. I’d taken a gamble on it, and I reckon it worked! It’s one of my favourite aspects of the model. The rest was quite quick to get together. The final step in each of the books was to make sure that it closed properly. There was a fair bit included in this one, so I had to make sure nothing clashed when it closed. I’m still not 100% happy with the closing of the Treasure Island book, but it’s good enough – I’ll tweak it a bit more eventually. To figure out if it closed properly (and to see what was hitting what), I took out the longer lengths of white “paper” bricks, and then closed it again. It meant I could see inside while it was closed, and tweak a few sections during this time. Building these books meant a lot of opening and closing! I’m also really pleased with how the photos turned out for this one – the reflective surface of the blue bricks is brilliant, and not something I had anticipated. 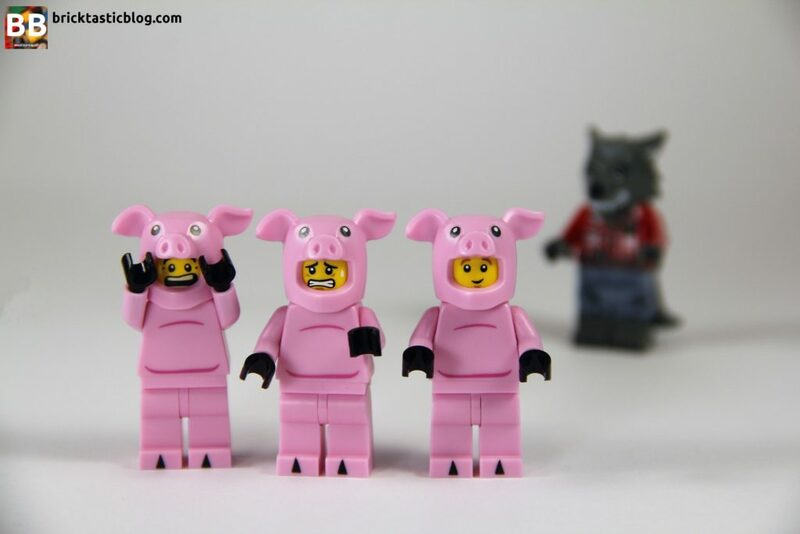 The last book was an idea I had got from one of my library colleagues – The Three Little Pigs. I instantly knew how it would look – the three houses in a line with the brick house in the middle, a stack of building supplies in one corner, and something else in the other corner – this ended up being a tree stump. 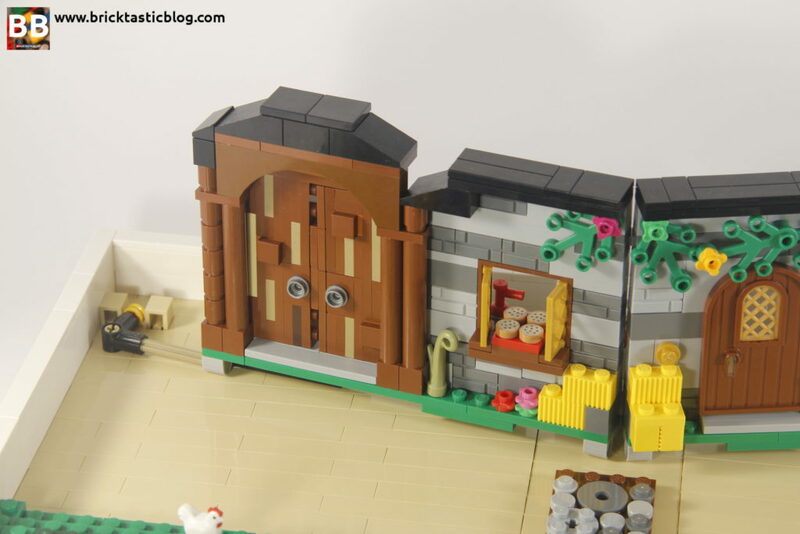 Inside the brick house would be a cauldron, to fit with the story. I also wanted to modify something I’d done in the copy of The Gingerbread Man – elaborating on the path. This time, it would be a bigger cobblestone style path, connected to the cover itself. 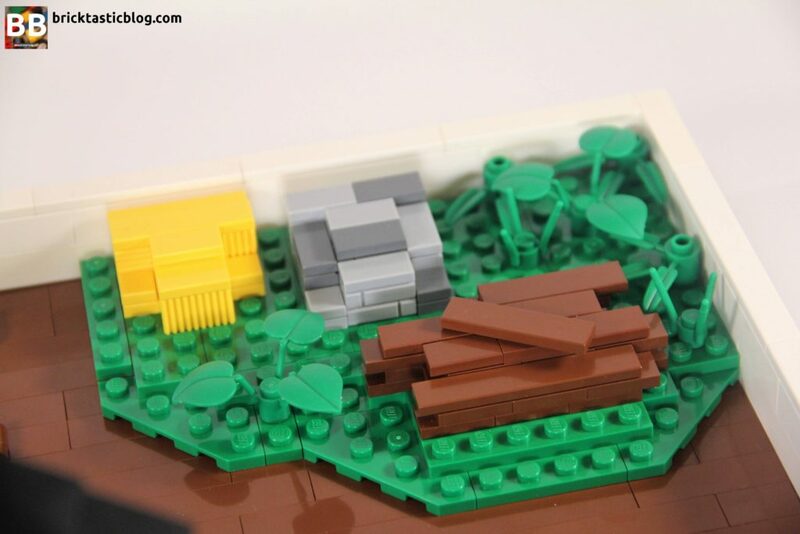 Again, all the designing took place in LDD, all the way down to the rocker bricks that allowed the straw and stick houses to “blow down” (quite pleased with this aspect too!). I’d originally anticipated building the tree stump with round 2×2 quarter arch bricks, but they didn’t exist in reddish brown, so I gave up on that idea and used 1×1 round bricks (reddish brown cannonballs) instead. I’m hoping to change this to a moulded tree stump soon, though. Bottom line – be careful when using LDD to design – it doesn’t tell you if a part exists in certain colours. As far as I could tell, it assumes that all parts are available in all colours. The other tricky part with this build was the path. 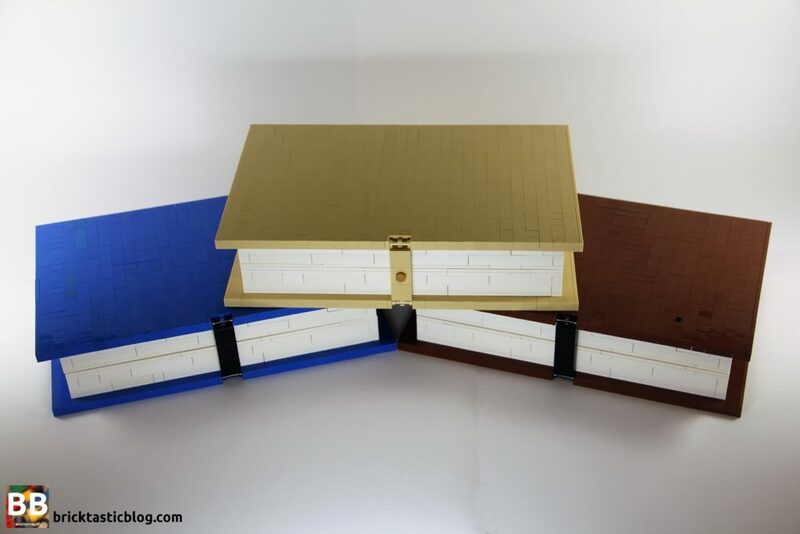 I ended up just going with my eye on the final build – it looked great in LDD, but the studs were sometimes off by a couple of millimetres, and yet still connected in LDD. Once the elements came in from my orders, it was time to build. I reckon this was my favourite book of the three. Getting the extra Piggy Guys was not cheap, but definitely worth it. I already had Wolf Guy from the Monsters CMFs, so he was perfect for the role. About the ordering – I love using LDD, but Bricklink’s Stud.io is a scary beast. I just can’t figure it out – it’s not intuitive to me. So, I’d design in LDD, export the model to Stud.io, and generate a wishlist from that. 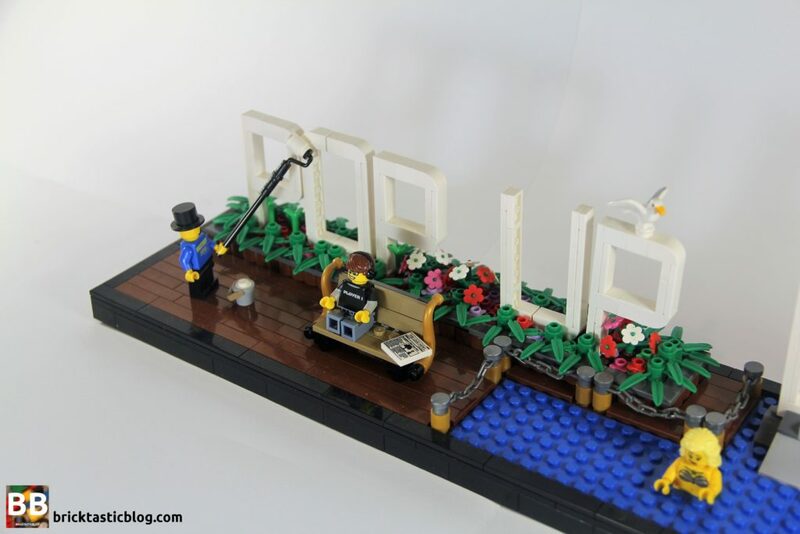 That would be sent to my Bricklink account, which would generate my orders. It was very easy! 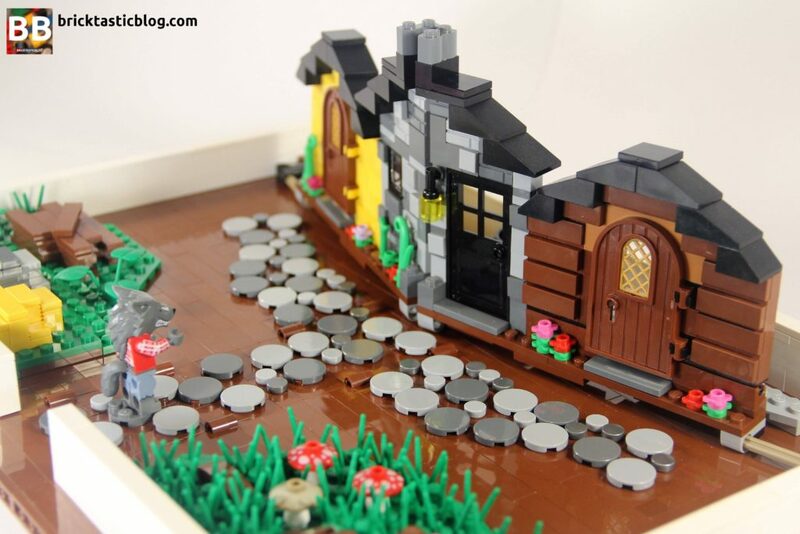 I will say now though, and this will be totally obvious to those more adept at Bricklinking – make sure you realise that you will probably spend more than you originally budgeted! It’s for those “just in case” moments. “I’ll order 50 instead of 30 just in case”, or “Oh, that’s cheap/rare, I’ll get some of them too”. It happened on every single order, but it was totally worth it. I also created a sign for the books. I figured when they were displayed, people might not realise what they were, so a sign (and also a video of one of them opening and closing) went along with them. 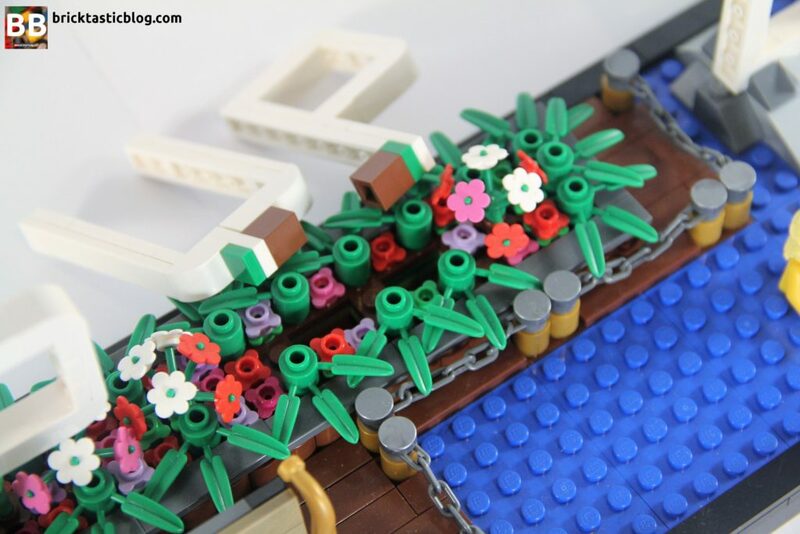 This was my chance to practice some LEGO lettering I’d wanted to do. I thought they ended up looking pretty effective. 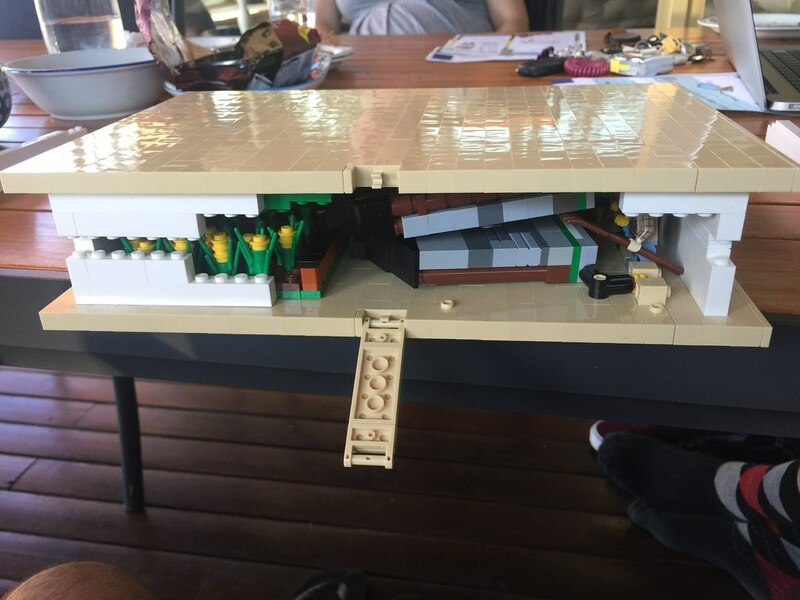 This build was done by getting stuck straight into the bricks. No LDD for this one! The letters were all sorts of colours while I waited for the white parts to come in. 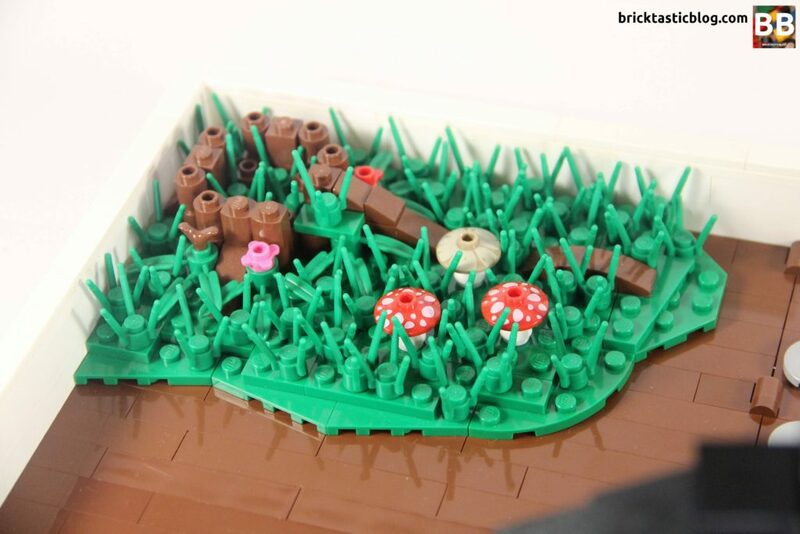 Here’s how they are stuck into the base – a 1×1 brick on it’s side. 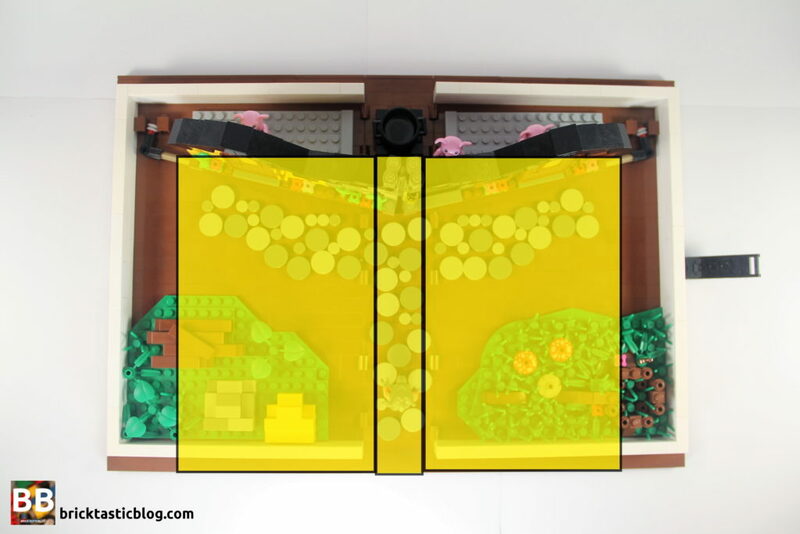 It had to be just the right size hole, but the geometry of LEGO is amazing, so it was quite simple to figure out. So that’s it! A massive thank you to Grant and Jason – your original design is stunning and so clever. I’m really glad I was able to build these, and thank you to Jason for all your kind words during the process! It was very exciting to receive your replies! 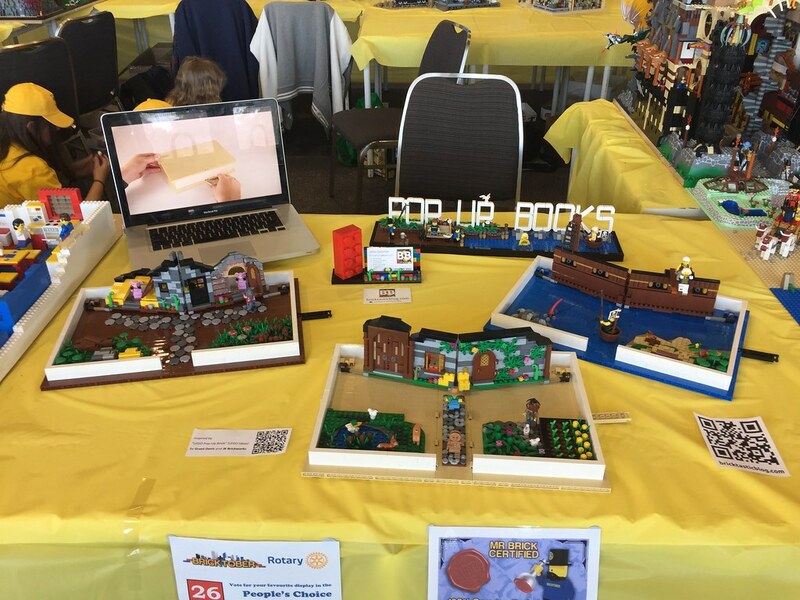 Also, thankyou to all of you that came to my display during Bricktober Perth 2017. It was extremely humbling and really exciting to talk to you! I was blown away by the love that was shown to these books, and the vintage Homemaker house that I had as well! It’s been an excellent weekend. If you want to see more photos of the books and the sign, head over to my Flickr account. There’s a collection that has all the albums included. 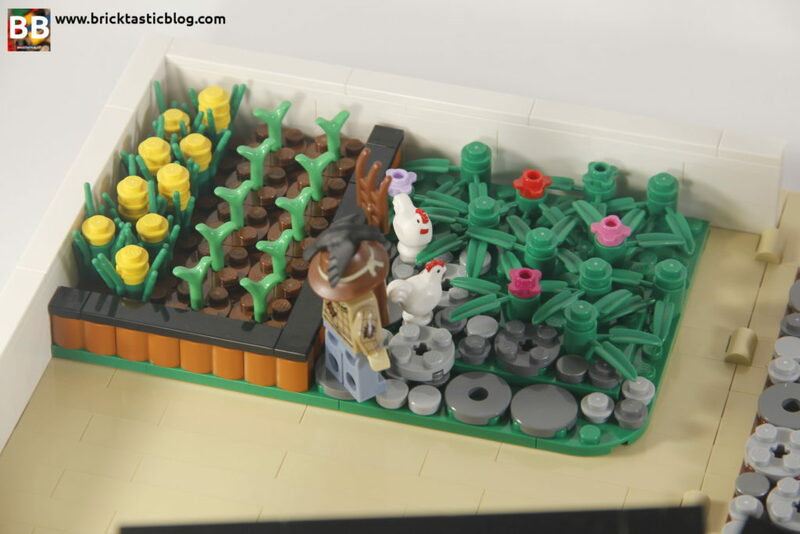 Have you attempted a modified version of a LEGO Ideas project? Have you got an idea for the next book I can try? Let me know below. A wonderful job here John. My daughter has been very inspired and we may even attempt one, one day soon. Thanks Kerry-anne! Let me know how you get on! Thank you for sharing and with such a detailed write-up! I really enjoyed reading about this and it inspired me to work on a similar project of my own. I’m curious if you had any issues with the main insert not popping up when it opened, and if so how did you solve that problem? I’ve constructed a book similar in size but when I open the book the insert doesn’t stand up, it just falls flat into the book. Appreciate any advice you might have, thanks again! What it might be (and I found this myself) was that it’s too tall, so too heavy. You might also want to put a stopper behind the hinge point on the wall, to stop it going flat. Let me know how you go! I’d love to see what you come up with. Thanks so much, that definitely the problem! I am making an anniversary gift for my wife with scenes from our relationship, including where we got married. I got a bit ambitious with how high I made the venue was and I was using far too many plates (too heavy!). Waiting on a Bricklink order now with some regular bricks so I’ll be able to finish it off. 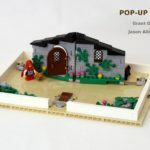 Hi John, I just got my Lego Pop Up Book final from LEGO, and love it, Seeing your installations has inspired me to get both Grants, Jasons and Your LDD files, I want to make them fit my own official sets, but just need a starting point. Is there a way I can use your LDD files? Hi John, send me an email through the Contact page and I’ll see what I can do! I contacted you a while back now and you haven’t replied. Any updates? Hi John, unfortunately I didn’t see an email from you, but I’ve got your email address now, from the comment, so I’ll drop you a line and we can go from there. Sorry about the delay! Thanks John, not a worry at all. 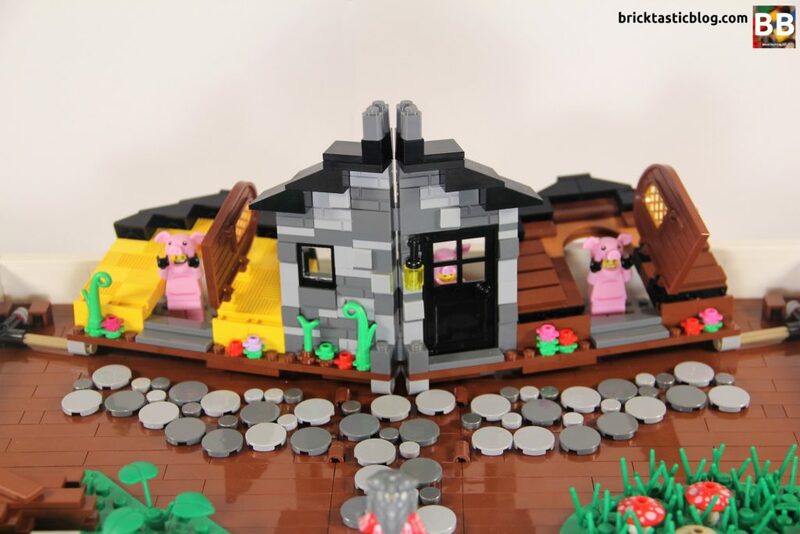 I can see the original designers and Lego have created a contest for a Bricktastic Pop-Up story. I love the new pop up book ideas. Is there any directions for those pop books? I am a special education teacher and using the pop up book to teach reading. Hi Francine, the new official set has instructions, but unfortunately my versions do not. The official version is amazing though! I’d highly recommend getting a copy or two for the classroom.